I always feel like I’m racing against time in early September. It has been beautiful lately but I typically can count on a September 15 first frost date, so I feel a need to take in as many of those summery veggies as possible. It is like working on the crew of a ship which you know is going to hit a big iceberg…I’m trying to get as many into the lifeboats to safety as possible but I know some will die needlessly. A pretty melodramatic vision, I know. This week we had to irrigate for the first time this season. It’s getting just like cement out there. Especially for some of these fall crops I have planted like kohlrabi and broccoli, they need some water if they are going to get to size. Acorn squash: I figure it’s getting to be the time of year when people get in the mood for Delicata winter squash: a sweet potato squash. Winter squash gets sweeter as it’s cured, so leave in a dry sunny place until ready to eat. The produce season is about where it should be this time of year. Last week we harvested all the onions and put into the barn to cure. The tomatoes and peppers are coming due in a big way and those melons are ripe for their annual two week window. I was peeking at the winter squash and pumpkins and many look like they are ready to go. Nights are getting cooler and our minds turn to autumn. With fall upon us, one thing which should get on your schedule is our annual fall harvest party. It will be Saturday, September 24 at the farm from 6:30 pm to whenever. This is a time to check out the farm and meet some other interesting people who are also CSA members. This is an appetizer/drinks/bonfire event. We used to do a potluck dinner, but this is more relaxed and casual affair. We provide all drinks and snacks, so just show up for a while. Another thing you should be thinking about in fall is turkey. I’m happy to partner with a neighbor of mind, Alex Johnson, who is raising free-range turkeys. His family’s been in the business since 1888 which makes him a 4th generation turkey farmer who really knows what he’s talking about. 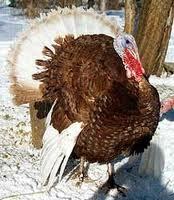 Later this fall he will have heritage-breed Bourbon Red turkeys at $2.05/pound and standard white turkeys at $1.50/pound. I’m helping him get the word out, so please call or email us to reserve a turkey and we’ll make arrangements. Cippolini onions: this is a really nice, flavorful onion from Italy. I dig it. I remember when I was studying in Rome, you’d see long braids of these things in the markets. I was thinking about this today and I just have to some more next year so we can do this because it’s so cool. A smattering of Tongue of Fire beans: this is a fresh shelling bean. Like dried beans, you can use in a soup or other dish, but the cooking time is a lot less since they are fresh. Daikon Radish: This is the white radish with the top. Peel and use as you would any radish. Since it’s an Asian radish, a typical way I like to make it up is grated with some rice vinegar and sugar.